over a week ago, i got tagged by one of my new blogger friends, damien at riley central, to talk about “the face behind the hands” (the blogging hands, one presumes). well, you guys get to see my face with every blog post, so i’m not going to add yet another one. but you’ve probably never seen my hands, so here’s a picture of my hands … no, wait, that one is on my husband’s computer. how about feet, then? here you have a particularly attractive picture: from a few weeks ago, in latest-fashion green scrubs, on stand-by for my daughter’s caesarean, beautifully accessorized by my black sandals! smashing, no? ok, i’m just going to come right out. when i got damien’s tag, i immediately thought of a topic that has always fascinated me: self-image. don’t really know why i haven’t written about this yet here. there’s just so many interesting things to talk about! so – let’s lead our scattered brains to this idea (i presume i’m not the only one with a scattered brain): self-image is the picture, idea or concept that we have of ourselves. it’s the story we tell ourselves about ourselves, and the story that we hope everyone will believe and tell about us. unfortunately, much about this is terribly unrealistic. especially this last part – it doesn’t take a rocket scientist to see that different people will tell and believe different things about us, and that there isn’t much we can do about that. we can try really hard (and lord knows, we often do) but really, there isn’t much we can make another person do or think. i meet people frequently who are unhappy because they are not living up to their concept of who they are or of who they imagine they are supposed to be … this is a sure-fire way to become miserable … at the point an individual becomes excited about who he or she actually is rather than who he wants to convince himself he is, enjoyment becomes much more attainable. enjoying yourself has more to do with actualizing your self than with actualizing your concept of who you imagine you are supposed to be. so let me see if i can bring this back to the meme. i honestly work hard at showing you who i am here, at showing you my true face. of course there are times when i fall behind that ideal. also, who i am changes, and who and what i feel myself to be is a bit different from day to day. i mean, i’m sure glad i’m not the same person i was when i was seventeen! how boring would that be? thoughtful, a little scatter-brained, compassionate, casual, full of never-ending interest in things psychological, always ready to laugh, quirky, lower-case-lettered, a bit of a brainiac, somewhat chaotic, a poet, a bookworm, not a geek but an IT enthusiast, always ready to ask yet another question, and, as i said a few days ago, someone who screws up every day and always returns to the path. so – who’s next? who else would like to show their face (or their hands, hearts or feet)? let’s try carol at alphablogs, david at loud murmurs, diogenes at the fine art of blogging; OCD on a stick, emi at emi’s universe, gledwood at gledwood2 and matt at decisionvelocity. This entry was posted in blogs of note, emotional health on June 21, 2007 by isabella mori. one of my twitter friends, ben, has been alerting me to all kinds of interesting links lately. through him i found this here, the 12 steps of liberation, a recovery program from a buddhist view. it’s brought to us by the universal compassion centre. 1. the truth of suffering. we experienced the truth of our addictions – our lives were unmanageable suffering. 2. the truth of the origin of suffering. we admit that we craved for and grasped onto addictions as our refuge. 3. the truth of the end of suffering. we came to see that complete cessation of craving and clinging at addictions is necessary. 4. the truth of the path. we made a decision to follow the path of liberation and to take refuge in our wisdom, our truth, and our fellowship. 5. right view. we completely see our life as it is. our goodness is indestructible. we are willing to acknowledge and proclaim our truth to ourselves, another human being and the community. 6. right thought. we are mindful that we create the causes for suffering and liberation. 7. right speech. we purify, confess and ask for forgiveness straightforwardly and without judgment. we are willing to forgive others. 8. right action. we make a list of all persons we harm and are willing and able to actively make amends to them all, unless to do so would be harmful. 9. right livelihood. we simplify our lives, realizing we are all interconnected. we engage in active compassion. we select a vocation that supports our recovery. 10. right effort. we acknowledge mistakes and relapse as part of the path. we continue to practice these steps with joyful effort. 11. right mindfulness. through prayer, meditation and action we follow the path of truth, being mindful moment by moment. 12. right concentration. open to the spirit of awakening as a result of these steps, we will carry this message to all people suffering with addictions. what do you think of this? i particularly liked, “our goodness is indestructible”. (as coincidence would have it, below these steps i found a link to the australian buddhist recovery site, which i had already mentioned in a previous post. i like it when that happens. it all felt really nice and organic). This entry was posted in 12 step discussion, spirituality on June 20, 2007 by isabella mori. in my internet travels, i have occasionally come across white bison, a recovery initiative particularly geared towards native americans, or first nations people, our term here in canada. as we keep coming back to the creator (or god, christ, allah, the universe, isis, our higher power(s), the path, our principles, dharma – whatever you want to call it/her/him/them), the idea of “screwing up” slowly changes. it may start with “oh darn, i did it again, what an idiot i am!” – lots of self-recrimination, probably grounded in an internalized idea or memory of a demanding, punishing authority figure. there’s a right and a wrong, and the screwer-upper is most definitely in the wrong. the idea of self-forgiveness is not even on the horizon; it lives in an entirely different galaxy. paradoxically, many people apply these cruel principles mostly to themselves. they may be quite aware of the idea of forgiveness and of the fact that most things in life are not black and white. what’s more, they may not even be aware of this double standard: a certain degree of forgiveness and understanding for others; fanatic, impossible-to-achieve perfectionist rules for themselves. at some point in the journey with the creator (let’s just keep this term, for simplicity’s sake), awareness dawns and you allow yourself to question this double standard. this can be unsettling and also exciting. it’s a new discovery but there are also implications: if this whole idea of screwing up is not about black and white, then what IS it? is it just all grey? are there shades of grey? it’s all very confusing. a question crops up: what can i forgive myself for? what is unforgivable? and what happens when the (mostly imagined) punishment does not set boundaries anymore? ideally, this phase leads into a period of experimentation. from a developmental perspective, this is similar to the teenage years: painful, fun, confusing, exhilarating – and identity-forming. a person who is focused on appeasing a punishing authority often only has a very rudimentary sense of self. “emancipation” refers to “moving out of the house of the father”. this is what happens here. 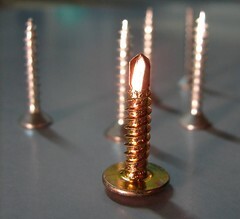 as we mature on the journey, we can view “screwing up” from a much larger perspective. we start realizing it rarely has anything to do with right or wrong; rather, with love and honesty, and with how people, places and things harmonize with each other. sometimes the screw fits and sometimes it doesn’t; and sometimes it sits in there a bit lopsided. that doesn’t make the screw or the wall “bad” or “wrong”. otherwise, we smile a lot as we notice ourselves along the path – at times wobbling, at others dancing, or stumbling, running, and spending a good time going in circles. we go from screwing up to admiring the circles that wind themselves around this very useful little tool. This entry was posted in spirituality on June 19, 2007 by isabella mori. in continuation of a post the other day on the need to respect individuality in therapy, i came across toronto nutritional sciences researcher ahmed el-sohemy’s work on the difference between men and women in reacting to caffeine. his research is connected to the field of nutrigenomics, a new field of study that eventually hopes to match optimal diets to a person’s unique DNA make-up. this is very important work. for example, jose cordovas, a researcher at the US department of agriculture found that there may just be a genetic reason for why some people can eat tons of cheese cake and still hardly gain any weight. this proves hopeful also, of course, for people who have the opposite problem – they just look at a sliver of donut and already they need a bigger size bathing suit! medical professionals would often dismiss this, saying that all one needs to do is reduce caloric intake – now it looks like it’s a little more complicated than that. i’ve always suspected that, particularly since my study on the widely differing reactions to pain medication by people afflicted with reflex sympathetic dystrophy (“RSD”, now usually referred to CRPS or chronic regional pain syndrome). our body chemistry is such an immensely complicated system and it just doesn’t make sense that it would be the same for everyone. nutrigenomics and metabolomics, a related field that examines the unique interaction of genotype and phenotype by mapping cell metabolites, are very new, and for now, attempts to use any knowledge gained in the studies are extremely experimental at best. however, i hope that in the future we will be able to apply this knowledge to help people with stubborn weight problems as well as food allergies. in the meantime, figure out what your favourite veggies are and eat them in abundance! This entry was posted in eating disorders, body image & similar topics, psychological research and other things academic on June 18, 2007 by isabella mori. i just called my dad. got voice mail. wished him a happy father’s day. hope everyone out there called their dads if that’s possible. neither fido nor rogers can make it possible, i think, to call my dad directly – he’s left this particular time-and-space universe almost 11 years ago. but that doesn’t need to prevent me from calling out to him, or maybe calling out about him. my dad was this amazing guy. an impoverished aristocrat, an arrogant intellectual, an avant-garde artist, a hopeless addict, a genius painter, a highly skilled manipulator, an incredibly compassionate man, a philosopher and writer, a man with a dark side that frightened some, a man with enough charisma for a whole city block. the first thing that comes up for me when i remember him are his hands. big, a bit meaty yet delicate and mostly – warm. full of oceans of energy. nothing’s a problem when these hands are there. another close memory is how he made me laugh. so hard! sometimes i literally peed my pants. but so often it went way beyond “making” someone laugh – these occasions of uproarious guffawing were more often than not a creative improv free-for-all – not so much laughing “about” something or someone but laughing with. i wasn’t there for his funeral in germany. his death was somewhat sudden, three days before glenn’s and my wedding here in canada. i had tears streaming down my face as i unveiled his wedding present – one of his luminous abstract paintings. his funeral was a good party, from all i’ve heard. lots of people at the grave. when they lowered the coffin, the first thing that was thrown on it, before any flowers, was one of his beloved “roth haendle” cigarettes. as soon as it made it there, a toad appeared and slowly jumped toward the cigarette, paused beside it for a while, and hopped away. This entry was posted in creativity: poetry, art, etc., general on June 17, 2007 by isabella mori. one of my favourite magazines is visions, BC’s mental health and addictions journal. it always has a great cross-section of mental health “consumers” (isn’t that a strange term?) and professionals writing about issues that directly impact people with mental health concerns: from those who are living with schizophrenia, to parents of youth battling with bipolar disorders, to social workers in the trenches of vancouver’s downtown eastside. by the way, i quit smoking 18 years ago, after 20 years of puffing away, sometimes two packs a day. being around people who don’t smoke and having had the experience of quitting a number of times (that is, knowing that quitting won’t kill me), were probably the most influential for me. This entry was posted in addictions, depression and mental illness on June 15, 2007 by isabella mori. from darfur to duesseldorf, from iceland to isla negra, from barcelona to benares, happy international weblogger’s day! rio akasaka brought this event into being a few years ago, and even though it doesn’t have such a large fellowship yet, i still like to participate in it. maybe it’s because i’ve lived in a number of countries (from germany to the UK, from paraguay to chile, and then of course here in canada). maybe it’s because of growing up with my father, who was so insistent on defying the idea of national socialism that even long after the second world war, he was proud not to have any nationality. the ideas of inclusivity and equality fit well with this year’s theme of international webloggers’ day: solidarity. i was thinking about the international organizations that i contribute to, and what that says about these ideals. there’s foster parents plan (now plan canada). with whom do i feel solidarity with people who live in circumstances that are difficult for most of us to imagine. not enough clean drinking water. often only one or no parent. under constant threat of deathly diseases. i’m mind-boggled by the inequality between their and my life circumstances and want to contribute at least a tiny bit to reducing the gap. then i like habitat for humanity. thomas szasz, the outspoken psychiatry critic (and a wild libertarian, yes, i know), said that many psychiatric problems could be solved by reliable, adequate housing. i have certainly seen with my own eyes, in vancouver’s downtown eastside, how people are driven crazy by living in dangerous, dirty, loud, bug-ridden, soul-killing rooming houses that charge almost three times as much per square foot as what i’m paying for my home (and, by the way, vancouver (un)real estate, who talks about this problem, is wrong in saying that these places take 50% of the monthly rate a person receives on social assistance; it’s more like 65%). i don’t want my brother to live like that; the idea makes me antsy, to say the least. i want him to be able to come home to a safe, welcoming haven. amnesty international. again, i guess my history plays a large role here – i grew up with stories of the holocaust. perhaps the first non-fiction book i ever read, i think i was 10 or so, was an account of a concentration camp survivor. it feels like i have a personal connection with people who have survived captivity and torture. so i put my money where my heart is, and give a bit to amnesty international. i hope this doesn’t come across as bragging. i certainly am not getting poor by contributing to these organizations; however, i hope that even the little that i do give has a bit of an effect. it was interesting, though, to spend a few minutes thinking about what ties me to these organizations on a more personal level. thanks, rio, for getting this process of reflection going. This entry was posted in blogs of note, peace, environment, social justice et al on June 14, 2007 by isabella mori. three years ago, coming back from a stressful visit to germany, i experienced the most terrifying nine hours of my life. i had an intense attack of fear of flying, the culmination of increasing unease i had experienced over the last few years whenever i was in a plane. last week, i was in an airplane for the first time again, and i was fine. i’d like to share with you how i got there. i journaled about it. one of the things i reflected on was the effect of that fear not just on me but also on those around me. that is always a good motivator for me to get moving. in this case, i reflected on the fact that many important people in my life live far away, and how my not coming to visit them would affect our relationships. i shared my fears with someone else. that was very helpful. my friend’s words were that i could just trust that eventually the fear would go away. that was one of those “right thing at the right time” moments – it was exactly what i needed to hear, it was comforting, and i did feel that trust. i did not allow myself to think that i would never fly again. that was out of the question. i made sure to be with a trusted person on this first flight “after”. of course my husband was just about the ideal person for that. and i told him about my fears – i did not have to deal with the added burden of shame or shyness that would prevent me from sharing this. i made sure to be fully present for the flight. distraction may work for some people but not for me. so i watched intently as the plane sped up, noticed the pressure of the lift-off, watched the clouds. having just started to read eckhart tolle’s the power of now certainly was an incentive for doing that. when feelings of fear came up, i didn’t look away. that was a particularly interesting experience and reminded me again that what we call “the moment” or “now” is actually a multi-layered phenomenon. there was the “now” of the fear, which i felt in my body – slightly sweaty hands, butterflies in the stomach – and then i realized that beyond that were thoughts and images that had triggered that fear. these images and thoughts (“oh my god, there’s nothing holding us up, what if we fall down?”) were not rooted in the moment, they were about something that was not happening – and something that was extremely unlikely to happen to boot. This entry was posted in emotional health, interesting books on June 13, 2007 by isabella mori.